A good, basic recipe for making your own pizza dough at home. Freezes well too! This pizza dough is quick to assemble and freezes well. If you make it ahead as I do, all you need to do is defrost it the day you plan to make pizza. We usually make 8 individuals balls of dough which gives everyone their own choice of toppings. Stir yeast into 1/2 warm water, mixing completely. Blend in 1 cup of flour, mixing well. Cover bowl and let rise in warm place for half an hour or so or till the starter is full of bubbles. Stir the salt into the remaining flour, mix well, and add to the starter. Pour in all but 1/4 cup of the water, and start beating by machine at slow speed and gradually increase to medium, or mix completely by hand. Knead for a good 5 minutes, adding additional drops of water till as needed till the dough is smooth. When it forms a smooth ball that includes all the flour from the sides of the bowl, transfer to a floured board and knead several times till smooth and elastic, and holds it's shape when bent back and forth between your hands. 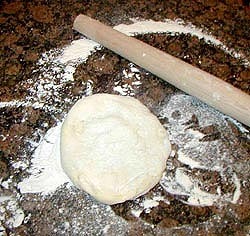 Form dough into a ball, dust with flour, and place in a lightly floured bowl. Cover and let rise till doubled, about 2 hours. To finish the dough, turn out onto a floured surface and knead for 2 minutes. You may now use it by either forming into 8 individual pizzas, or divide it into 4 pieces, making one pizza for two and freezing the rest into 3 remaining balls, well wrapped. Note: The dough may be kept in the refrigerator over night, in a well oiled pan, brushed with oil, and covered with plastic wrap. To use, remove and let warm to room temperature, and then form into pizzas as desired. Special Tip: To quickly warm refrigerated dough; place in a microwave-proof bowl, cover with plastic wrap with several holes poked in, and microwave on "defrost" for two minutes. To defrost a ball of frozen dough; Microwave on "defrost" one to two minutes, let rest five minutes, then defrost for another minute. Let rest another five minutes then knead and squeeze to soften any lumps; let rest to come to room temperature.